Cletus Challe began fishing in Lake Michigan in Kewaunee Co. in the mid-1960’s as a charter captain and spent 41 years on the water. As more and more people from all over the country flocked to these waters for sport fishing, Clete, as he’s known by friends, saw an opportunity. He decided to buy a motel in Algoma, which would be open for the fishing season, to cater to the many fishermen descending on the area. He and his wife Nancy, who currently reside in Kewaunee, bought the Harbor Inn Motel in Algoma in 1985, and operated the business for the next 20 years. Nancy operated the motel, while Clete was running the charter fishing and doing most of the maintenance on the motel. “Everybody would come to fish, and the hotel was full because other charter captains would send their clients to us to stay the night,” says Clete. And the fishing was good. Challe says, “In the early days, people were lined up waiting on the docks to get on a charter.” At one point, he even had the state record salmon in 1984, weighing in at 43 lbs., 3 oz. The motel, which is located right on the Algoma harbor is a great spot for fishermen needing a place to stay. In 2005, Clete sold the motel to his son-in-law and daughter, Jeff and Vicky Vollenweider. The couple first got started in the motel business in 1994, after buying the Coho Motel in Kewaunee. They had always wanted to buy the Harbor Inn Motel, but Clete and Nancy weren’t quite ready to retire at the time. Faced with having to move to a big city for work, the couple started looking for business opportunities in the area. “We lived in Algoma and didn’t want to leave, and then we found the Coho Motel,” says Vicky. 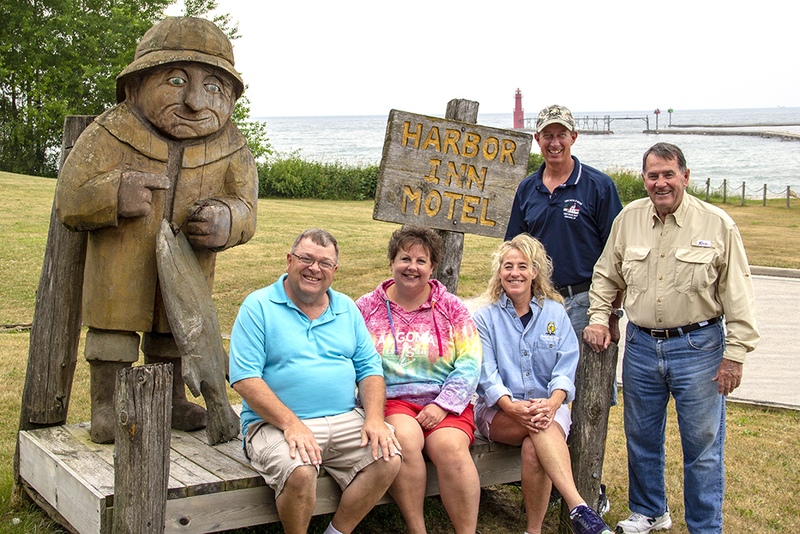 After ten years of running the Coho, they bought the Harbor Inn when Clete and Nancy retired. 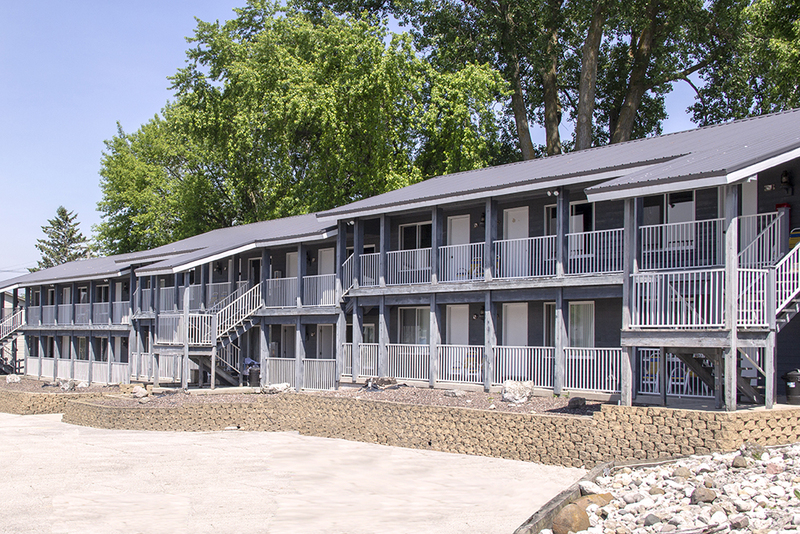 “We were very happy to step in when they were ready to leave, because it’s a beautiful piece of property, looking out over the marina and the lakeshore,” says Nancy. Jeff says the location of the motel is definitely a plus. “It’s really nice having the marina and the motel right there, charter boats are all right there, that’s worked great for all these years. Current manager of the Harbor Inn, Randy Vogl started managing the motel in 2013. He and his wife Maria had been coming to Algoma nearly every weekend in summer for years and says, “We just fell in love with Algoma.” So when he saw a job opening to run the hotel, he jumped at the chance. His wife Maria, or as Randy calls her “she who must be obeyed,” also works at the motel. Harbor Inn Motel is open from mid-May through October, sometimes staying open later in the season if there is a Packer’s home game in early November. The motel offers a shuttle bus on game day for those who need a ride to and from Lambeau. Randy says the motel is full most weekends in the summer, and most guests are here for the fishing. The motel is fully booked for Shanty Days and The Wet Whistle Wine Fest as well. Next to the motel is Old Salty’s Gift Shop. The shop is one of the few places in Algoma for tourists to get Algoma gifts and apparel. The shop also offers nautical gifts and lighthouse collectibles. Along with the gifts, Old Salty’s also has passports and a stamp for the Lighthouse Passport Program. The program encourages lighthouse enthusiasts to visit lighthouses around the country, and they receive a stamp on their lighthouse passport at each one they visit. Old Salty’s is the only place you can get a stamp for the Algoma Pierhead Lighthouse, which is just steps away from the motel and gift shop. 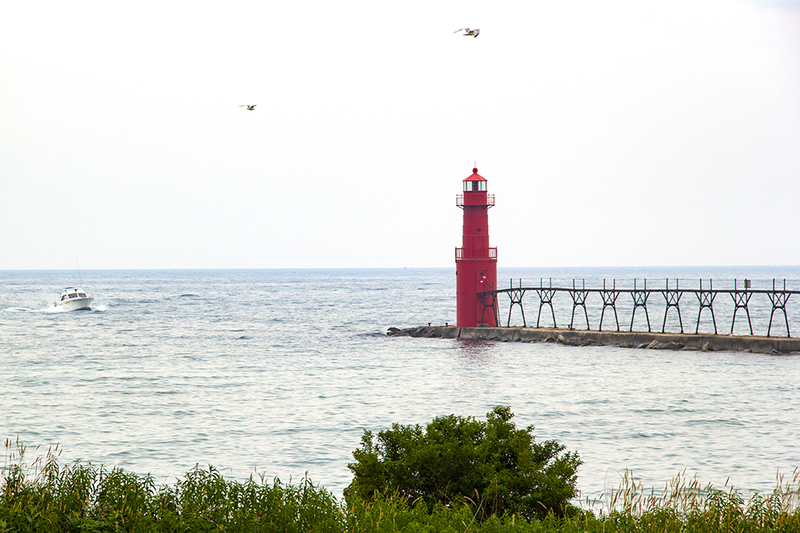 “We’re as close to the lighthouse as you can get,” says Jeff. The Vollenweiders now hope to help tourism and traffic through the area. The couple is working with the Kewaunee, Algoma, and Mishicot Chambers of Commerce to try and re-establish the “scenic route”, hoping to entice more traffic from tourists on their way to Door County. Jeff says it’s nice to see the different chambers working together on something like this that can benefit all of us. Visit Harbor Inn’s website for reservation information.